After having a devastating 2013, and fighting my way back to sanity it's time for me to take care of me. In August 2013 we lost our oldest son, 22 yrs, to a freak accident. The seemingly bottomless pit that throws you into is indescribable. It took 2 yrs to reach the top of that pit so I could just look out. 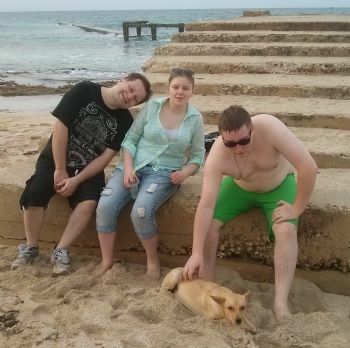 The change came when we took our other 2 children to Varadero, Cuba for a quick 3 day break in January 2015. (yup my kids made sure to have a "pet" while in Cuba, that was 1 of 3 dogs that hung out with them at the resort). We spent alot of time exploring the town, enjoying the water and making friends with locals. That trip started our journey back to being an engaged family again. In the spring of 2015 we got a great deal on 2 older jet skis. The kids and I spent most of the summer out on them, hubby had to work where I had alot of time off. I will admit that this has brought the kids and I closer together. It also brought my husband and I closer again. In November, hubby and I went back to Varadero for a week. This time we went to Havana for a day, took a catamaran cruise where we went snorkeling (not smart for an out of shape asthmatic lol), and spent time enjoying the town and beaches again. I ate so well and healthy while we were there. I came home and cut back on the junk food (about 90%) and cut way back on the pop. In June I ended up at the hospital with chest pains. I was under alot of stress at work, wasn't eating or sleeping well, my husband was having some issues with pain in his shoulders and other parts of his body that he still tries to ignore. Thankfully no stroke or heart attack but I was officially diagnosed with Type 2 Diabetes and high blood pressure. It was a crappy summer. I was too tired, to stressed, too sore to enjoy it. I went out on the jet skis twice, I was depressed. I knew it and hid it from the rest of the family. I ended up loosing my job at the end of October due to technical issues with our home internet connection. So here I sit at home trying to find a job, thinking about going back to school and overall being stressed and bored..lol. I started watching food/health documentaries. And I watched a few that gave scientific proof (proof you an google and read up on the actual journals/reports) of how a plant-based diet can not only control but possibly even reverse some if not all the damage I've done to myself. Like most everyone else, I don't want to be on the meds. While we were in Cuba I ate very little meat/seafood, way to many veggies, fruits and rice dishes to eat were available. I had one or two pops there (Coke was available in town and they had Fanta at the resort), ya we had beer to but even at that not much - the bartenders teased us about how little we drank at an all inclusive resort. They saw us more for water bottle refills than booze. So after watching all these movies/videos, I decided that even if the family doesn't participate I am moving this house to a plant-based lifestyle. I'm not sure yet if it will be 100% - I love me a BBQ grilled steak once in a while. I have to empty the fridge, freezer and cupboards of the bad "stuff". But with money tight, I'm not going to just throw it all out and honestly it's not fair to the rest of the family. So right now, I'm limiting the meat meals to 1 or 2 a week till it's all gone. The kids are 18 and 19 now so they can cook and make their own foods with what's in the cupboard till it's gone then they will have to buy their own if they don't want to eat what I make, same with the hubby. The fridge is full of fruits/veg - it was on sale last week so good timing. I have frozen some kale (adding to cooked meals) as well as have some in my dehydrator (yup I have one and used it for the longest time for dog treats and the odd human jerky). I'm going to make use of my dehydrator to do mushrooms (they were on sale too) and try different things, especially fresh herbs when I need to buy them so the rest I don't need in a recipe don't go to waste. Not enough sun in this house to grow them in the winter, I have some outside and fingers crossed they over winter like my chives do. I started this path last week (Nov 17th). Bought all this good stuff and started to eat better using it. When I look back over the week of food ate, one meal was meat - beef vindaloo. I had french toast using eggs a couple of times. The rest was all plant based and I started to feel good. The pains I get in my hips/back/shoulders was less, especially in my hips - it didn't hurt to walk up and down the stairs, and daughter commented yesterday on how fast I was walking when we went grocery shopping. While shopping, I picked up 3 frozen pizzas for lunch. MISTAKE! 30 minutes after eating it, I wanted to have a nap. Slept horrible, but worse of all, the pain was back. I've been sore almost all day. So there is my proof that I need to make this change. Also grocery wise, I normally spend over $200 a week on groceries, this week $123. and that included some junk food not on the list so the cost for eating right was actually under $100. The one thing I know will be an issue is Rockstars. When I was dragging my behind and couldn't get the energy to even get through the next hour I would crack one open, some days 3. I had to have one today to get through the afternoon and making dinner. And there is another one sitting in the fridge. Though today it's not calling to me every time I open the fridge. I'm going to try an post all the foods I eat. The "meatloaf" (made with lentils & tofu) tonight was a fail so I will throw that recipe away and look for another. What is always a hit here and something I've always made is just a veggie concoction. The last one include: potatoes, carrots, corn, cauliflower, kale, spinach, mushrooms and a mix of favourite spices and a little soy sauce. No oil or butter added. It's always made with whatever veg I have on hand or in the freezer. I think this blog is long enough. I promise to not do these long ones to often. But I will be trying to post daily, especially since we're embarking on a food journey into what some days feels like the unknown. I am sorry for the loss of your son. Congratulations on the new start to a healthier you. Keep up the good work. I am so sorry for the loss of your son. That's hard to come back from. I lost my husband 5 years ago and I am still working on getting over it. You have had a lot of hard knocks but you are now taking positive thoughts to get you back on track. With healthier eating you will do much better...and, as you said...the rest of the family can fend for themselves if they don't want to eat what you have cooked. You may even bring them around to healthier eating.